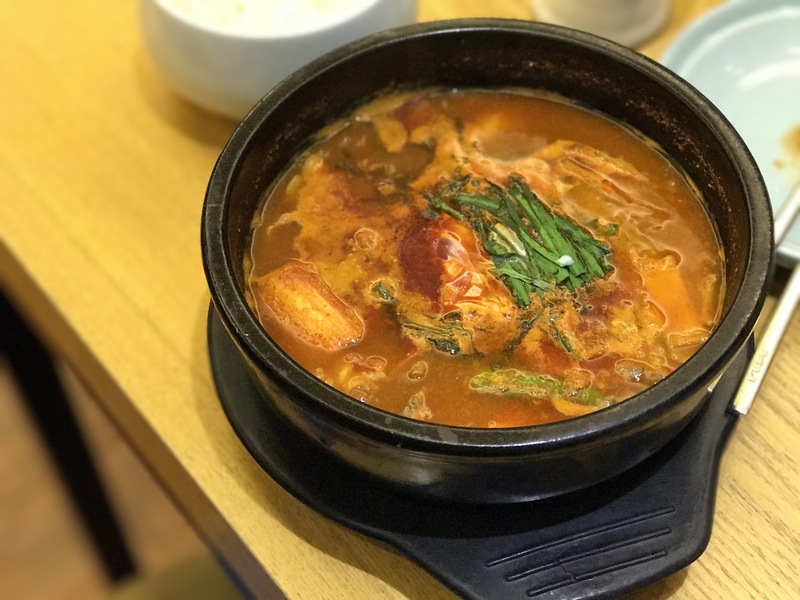 Photo of the day: Seafood and Kimchi pancake in Myeongdong. Photo credit: Aaron. We have come to our last day in Seoul. We were hoping to grab some brunch on this sunny Saturday, so we headed over to Itaewon, back where we began. Not surprisingly, this expat-friendly area, has plenty of western brunch places to chose from. We even saw a “Canadian restaurant” and were curious as to what they would serve. Their menu included pancakes, bacon and poutine. Interesting. 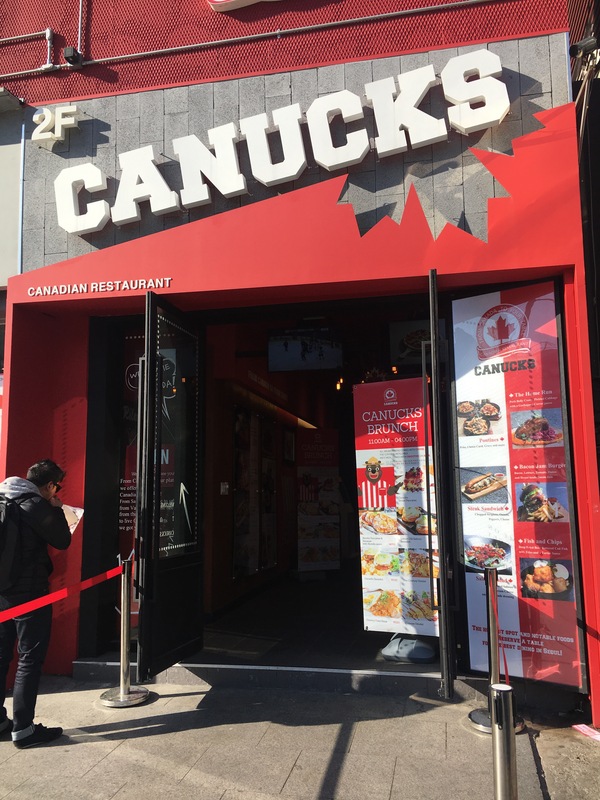 A Canadian restaurant for those home sick Canadians in Seoul. Our restaurant of choice was Suji’s. Unfortunately, it looks like it has closed. Luckily, right down the block from where it should have been, we saw some attractive brunch items being advertised. Most importantly, it was a restaurant specializing in churros. We later found out it was the same churros as the ones we had last night – from the street vendor with the same name, Street Churros. Aaron ordered the American breakfast with churro and I had the club sandwich which came with churro fries. Aaron’s breakfast was ok but what really brought the meal to life was the churro. My sandwich was very tasty, which I attributed it to the mayo and the sausage patties they used. The churro fries were also amazing, especially when dipped in the plum sauce provided. We hung out there a little longer to get some work done and people watched. There were many kids on the street this pleasant morning with the temperatures finally above 0 C. We also noticed many people holding white flowers, but had no idea why. Does anyone know? We couldn’t say no to a churros restaurant. 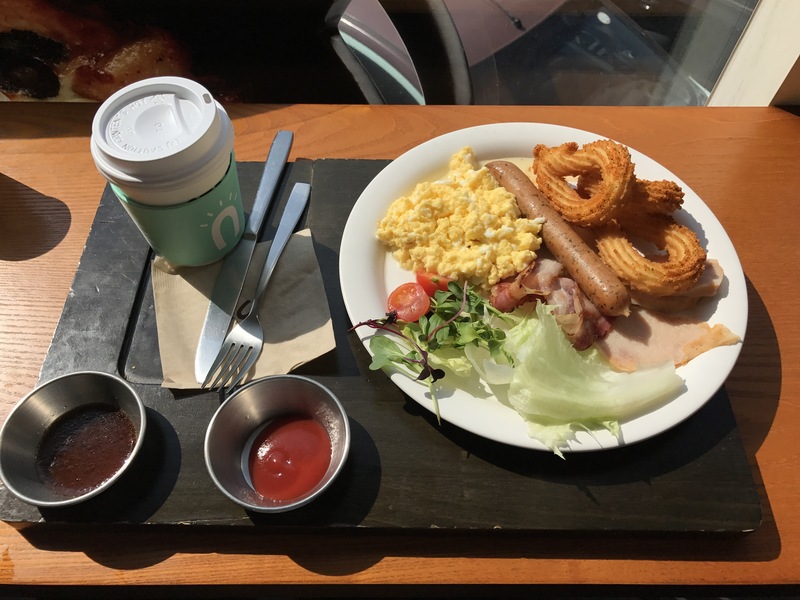 American breakfast with churro @ Street Churros. Photo credit: Aaron. 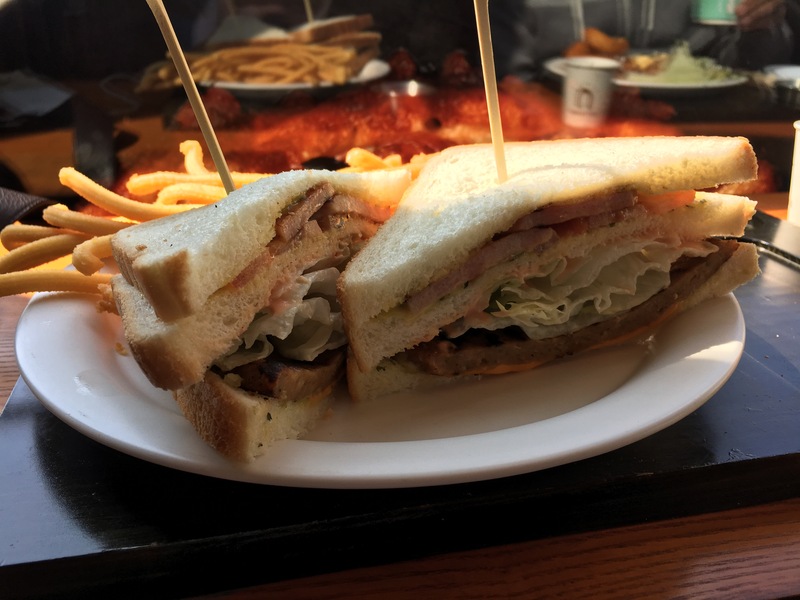 Club sandwich @ Street Churros. 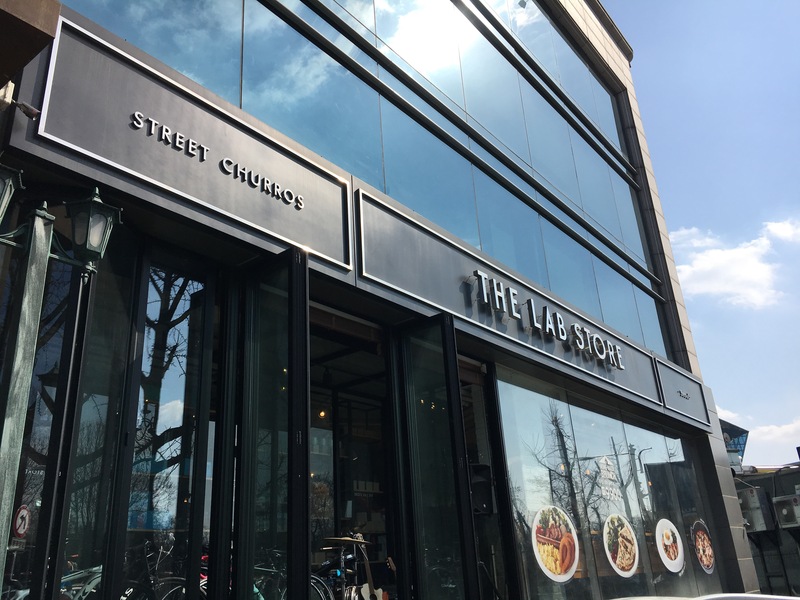 We walked around Itaewon seeing what it was like during the day. It was still busy but not as lively as it was at night. Some of the popular restaurants already had many people lining up outside of it at 4-5pm. We then went over to Myeongdong to meet up with Aaron’s cousin, who previously studied in Seoul. While waiting for her, we decided to try a few more street food items. I saw Mike Chen eating the cheese skewers the other day and was curious as to how good it really was. 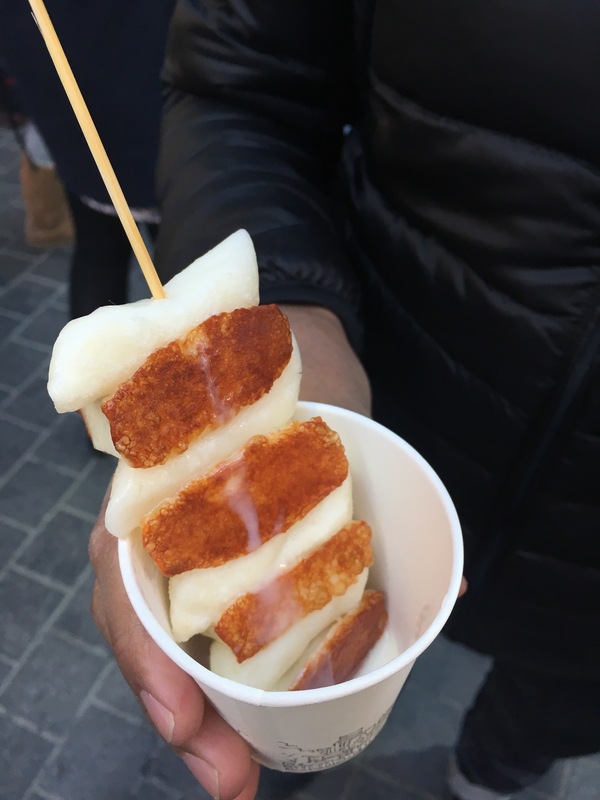 The skewers consisted of a light cheese alternating with rice cakes, drizzled with condensed milk. It was not bad but also not as mind-blowing as I had expected. We were thirsty and were hoping to buy some pomegranate juice but found out it was 6000 KRW! This was 3 times of the price of those we got in Thailand, so we decided to get some Sikhye instead. Aaron has been seeing many people with tall soft serve cones and we finally found the stall for it, so we went ahead and got the 32” mixed cone. The soft-serve was not the most delicious, so it was more for novelty. We did not even end up finishing it. 32″ soft serve in Myeongdong. Aaron heard me mumbling in my sleep last night that we still have yet to try the Korean pancakes here, so we got a mixed plate of the seafood and kimchi pancakes (see featured image). I preferred the seafood pancake but felt that both were too oily. We were hoping to get dinner with Aaron’s cousin but by the time she arrived, we were full from all the street food we had. She wanted to show us around and brought us to Samcheongdong. She said it was close to Insadong and the palaces and is a nice street to walk along. We got out of Anguk station and were suddenly surrounded by a squad of policemen. We walked out and there were more on the streets. We kept walking and some the streets were blocked off by big buses, which had even more policemen in them. By this point, we were very curious as to what was going on. We heard some chanting in the distance as well as some people with flags and banners. We deduced there was a large protest happening. According to Aaron’s cousin, the people here are very passionate. They would hold large protests until the government acts. She was disappointed that the view of the nice streets are currently blocked off by the large buses but it is also not everyday that you will witness so many policemen on the street, at almost every corner we walked. We decided to sit down at Hansik for some food. We ordered the beef tartare Bibimbap, spicy beef brisket and tripe soup and Bulgogi stew. We also tried their Makgeolli. The food was alright. I was surprised that the spicy beef soup had full-on intestines and not tripe as I had expected. I was not a fan of that. The Makgeolli was sour, and not sweet at all compared to the previous Makgeolli’s we’ve had. As the night progressed, the policeman formed a line in front of the restaurant, so we were advised we should probably leave now or else we might not be able to leave later. 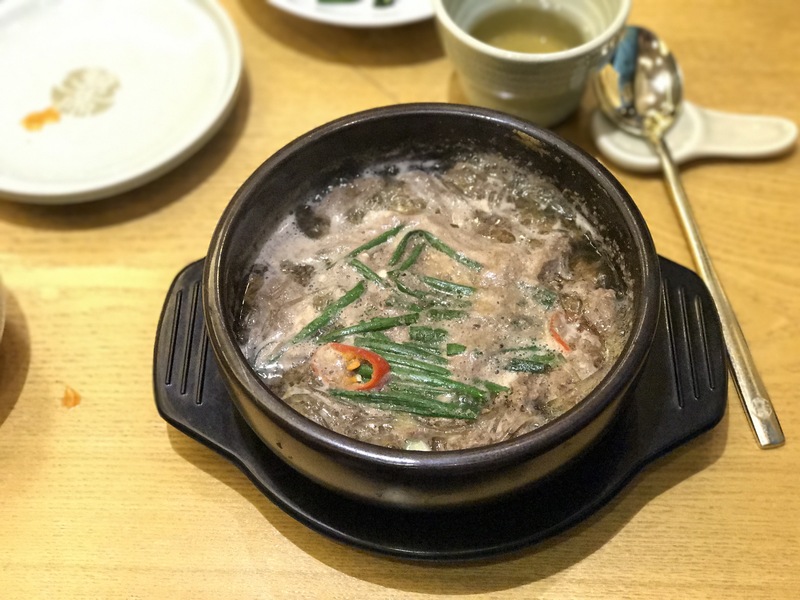 Bulgogi stew @ Hansik. Photo credit: Aaron. 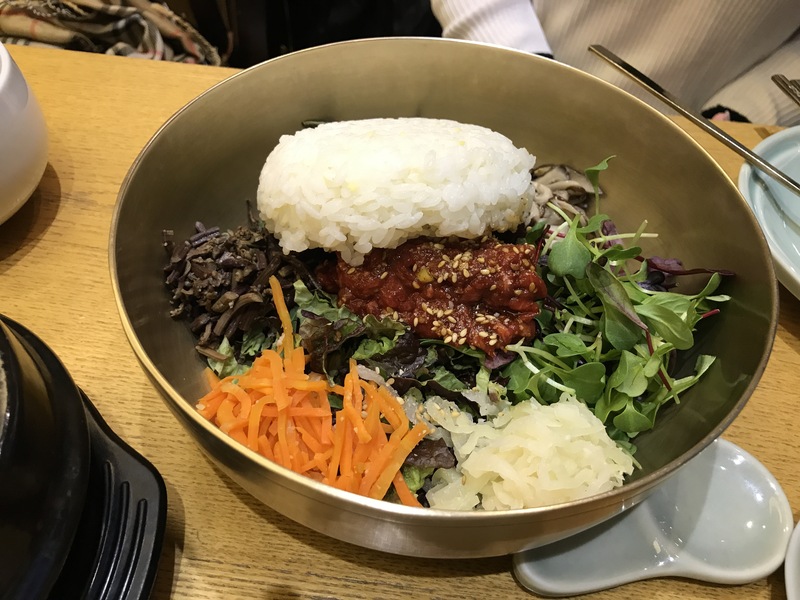 Beef tartare Bibimbap @ Hansik. Photo credit: Aaron. Spicy beef brisket and “tripe” soup @ Hansik. Photo credit: Aaron. We ended the night with some last minute shopping at Lotte Mart, then headed back to our place for some leftover Makgeolli from last night before getting to work to start packing for tomorrow. It was definitely more challenging to pack this time around, after having visited the shopping-obsessed city of Seoul. Cheese… and condensed milk? 😮 It doesn’t really sound that appetising, but kudos to you for trying aha, I’m not sure I would have! Crazy about the protests too! LOL if I had a ruler, I would’ve!! But hey, the folks selling the soft serve have! Its suppose to be: if it ain’t the right height, they refund or something!